On December 25, "Mary Poppins Returns" will grace all of our lives. It's going to be hard to wait that long! 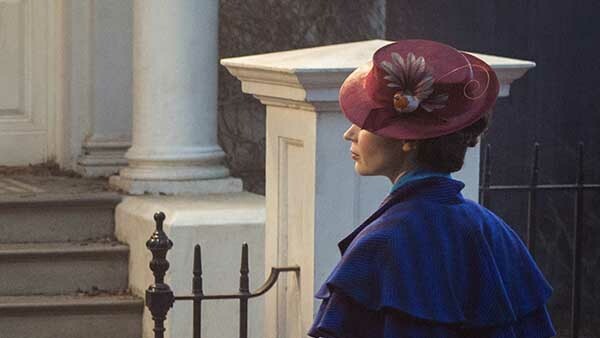 But on Oscars Sunday, just after stars Emily Blunt, Meryl Streep and Lin-Manuel Miranda walked the red carpet, Disney dropped the first trailer for the new "Mary Poppins Returns" movie. "Mary Poppins Returns" tells the story of a reunion between a now-grown Jane and Michael Banks, and Mary Poppins. Emily Blunt of ''Mary Poppins Returns'' arrives at the Oscars on Sunday, March 4, 2018, at the Dolby Theatre in Los Angeles. This hits theatres March 9, and we are so ready to see the incredible cast in action, under the direction of the incomparable Ava DuVernay. Here's the trailer, if you just can't wait 'til then! For tickets, keep checking here. This galactic adventure returns to Disney Cruise Lines January to April. Read all about the incredible time we had at this year's Star Wars Day at Sea here. The television classic comes to ABC on March 11, and we can't wait to see what this judging team brings to the table. We're ready to meet the next generation of stars! If the trailer made us lose all our remaining chill, just wait until May 4 when this film comes out. On May 25, Han Solo is back! Celebrate everything you love about Pixar at Disneyland Resort in spring of 2018. Debuting at Disney California Adventure summer 2018, Pixar Pier is going to be an incredible place. We can't wait to ride the Incredicoaster! Get a sneak peek at the land coming to Disney's Hollywood Studios in Walt Disney World Resort this summer. Have you seen the trailer for the film, out June 15, yet? If not, you must go watch it now! This movie looks so whimsical and magical, and we cannot wait to see it in theatres November 2! Oh My Disney gets mentioned in this movie, and we are oh-so ready for it! November 21 is the day our dreams of being in a Disney movie finally come true. The Walt Disney Company is the parent company of Oh My Disney, Walt Disney Pictures, Lucasfilm, Marvel, ABC, Walt Disney Parks and Resorts and this station.